We use lots of equipment on our various field excursions, everything from geological hammers, to plastic tubs, sieves, magnifying glasses and geo rulers. Geo rulers are sturdy plastic rulers that are used to help measure and map fossil sites. They also come in handy when we want to show scale in any field photographs that we take. Naturally, there is the old faithful geological hammer to use as well, but we sometimes prefer to show a more precise scale. It is ironic then that we have found a new use for our geo rulers, they help us when we take pictures of various dinosaur models. One of our field rulers provides scale. The brightly coloured ruler with its clearly marked sections shows the scale and size of a model very nicely. In this case, the picture above shows the Collecta Bistahieversor model. This dinosaur model measures a little over thirteen centimetres in length. Our readers can get a clear idea of how big the model is, thanks to those very handy field rulers. A few days ago, Everything Dinosaur announced the list of prehistoric animal models that had been cleared for production and sale in 2015 by Collecta. The list has been very well received by model collectors and dinosaur fans and it is great to see so many replicas being added to the Collecta range. We can now reveal more details and show pictures of the models that will be part of the first releases next year. The first five prehistoric animals to be introduced are the Xiongguanlong (pronounced “shyong-gwan-long”), a primitive member of the Tyrannosaur family. Then there is Medusaceratops, Nasutoceratops, two lovely horned dinosaurs. 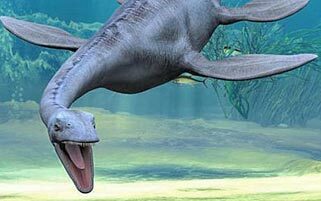 The Deluxe Pliosaurus is also one of the first to be manufactured and then fifth, last but not least, is the spectacular model of the huge dinosaur called Daxiatitan. Formally named and described in January 2010, this long-snouted predator provided evidence that even in the Early Cretaceous some types of tyrannosaurid were growing into large predators. At an estimated five metres in length, this dinosaur (X. baimoensis) represents one of the larger of the early Tyrannosaurs. Evidence of a shaggy coat of feathers has been provided by the model makers and it is pleasing to note that the three-fingered hand (basal trait of the tyrannosaurids) has been reflected in this model. Named after the Greek Gorgon Medusa who had snakes for hair. This dinosaur, like Xiongguanlong was also formally named and described in 2010. The extensive horns, lumps and bumps (epoccipitals) on this dinosaur’s neck shield were spectacular, these have been lovingly re-created in the Collecta replica. They may have had a defensive function but they also served as “bling” to help attract a mate and for display (probably). Medusaceratops was a member of the Chasmosaurine group of horned dinosaurs. The second major group, the Centrosaurines is represented by Nasutoceratops. This mean and moody figure contrasts well with the Medusaceratops replica. Nasutoceratops would have been slightly smaller than Medusaceratops, it roamed the swamps and lowlands on the western shores of that great inland sea that divided the Americas (the Western Interior Seaway). One species has been assigned to this genus (Nasutoceratops titusi). The very large and broad muzzle can be clearly seen on the Collecta replica. We shall see how this model compares to the Safari Ltd Nasutoceratops which is also due out in early 2015. The first of the new Deluxe replicas due out next year is the model of the ferocious marine predator Pliosaurus. We like the details around the jaw, the evidence of “battle damage” as a result of feeding from parasitic Lampreys on the flank and the beautiful colouration. These are going to be exciting times for model collectors who have an affinity for marine reptiles. Last but not least comes a replica of the Chinese Titanosaur Daxiatitan. We have to confess that Chinese Titanosaurs is not our strong suit, probably because of the fragmentary fossil finds coupled with those complex names derived from regional dialects. Daxiatitan binlingi is known from fragmentary fossils, including several huge cervical vertebrae (neck bones) and a femur. Based on comparative studies with other basal Titanosaurs, it has been estimated that this huge dinosaur could have reached lengths in excess of thirty metres. It had a very long, straight neck and it probably fed on the very tops of the trees, although its giraffe-like pose is still debated. It certainly had a wide body and Daxiatitan is just one of a number of Titanosaurs known from the Hekou Group in the Lanzhou Basin of Gansu Province (north-western, China). The fossils of this dinosaur have helped researchers from the Chinese Academy of Sciences to piece together more information with regards to the evolution of titanosaurids. This is a very well crafted replica, that reflects what is known from the fossil record with regards to basal Titanosaurs. We look forward to posting up more information about Collecta’s 2015 range shortly. The giant prehistoric shark known as Megalodon (C. megalodon) has certainly attracted a lot of scientific attention in recent years. This predatory shark, believed to be the largest, carnivorous shark to have ever existed, might have reached lengths in excess of sixteen metres. Bodyweight estimates vary, but a number of scientists have calculated weights around the twenty tonnes mark. With a mouth that could gape nearly 3 metres wide, this fish would have been capable of swallowing an extant Great White shark (C. carcharias) whole! Some fishermen, such as those who fish the waters off South Africa have claimed that Megalodon still exists, but a team of researchers from the University of Zurich and Florida University have used a statistical technique to provide the best estimate yet of the extinction of this apex marine predator. Writing in the on line journal PLOS One (Public Library of Science), the researchers Catalina Pimiento (Department of Biology, University of Florida) and Christopher Clements, (Institute of Evolutionary Biology and Environmental Studies, Zurich University), used a statistical analysis to calculate the approximate time of the extinction of these predators. By developing a better understanding of the time of the extinction, the research team are able to map the consequences of the extinction of an apex predator on the marine ecosystem. Using a mathematical technique called Optimal Linear Estimation (OLE) the scientists have calculated that around 2.6 million years ago C. megalodon became extinct. This is the first time the extinction of C. megalodon has been quantitatively assessed. A total of fifty-three fossils of this ancient shark were used in this study, but this number was reduced to forty-two for the statistical assessment, as eleven of the fossil specimens gave the researchers less confidence over their actual age. Optimal Linear Estimation is used for mapping the extinction of modern species, but with the abundant and widespread fossil record of Megalodon, mainly the large number of fossilised teeth associated with this species, the team were able to apply this mathematical method to calculate the time when the very last of these magnificent creatures lived. Although the team admit that their calculations are subject to margins of error, this work represents a refinement on previous estimates of the extinction of this shark species. Why this apex predator became extinct remains a mystery. Most Megalodon fossil material dates from around 16 to 11.6 million years ago (Miocene Epoch) with some further fossils known from the Pleistocene Epoch, although a lot of the fossil material associated with Pleistocene deposits were not included in this particular study. With a more accurate extinction date established, the researchers can then assess the impact of the removal of a large predator from the marine environment on other genera including Cetaceans. The date of 2.6 million years ago marks the border between the Pliocene and Pleistocene Epochs, it was after this point that the baleen whales began to increase in size and to evolve into the many giant forms alive today. As marine mammals are thought to have made up a substantial part of the bus-sized shark’s diet, although there is no conclusive evidence to suggest Megalodon fed on large whales, if Megalodon died out, did this trigger the flourishing of the baleen whales? Megalodon is a prime candidate for this sort of statistical analysis, due to the relative abundance and widespread distribution of its fossilised teeth. It is hoped that this technique can be applied to other extinct species to plot more accurately the impact of a single species extinction on the wider ecosystem. Did Megalodon Feed on Large Cetaceans? Did this apex predator attack large whales? There are lots of female scientists all helping to make a significant contribution within their chosen specialist fields. In palaeontology, many of the world’s top researchers are female, the gender imbalance in the sciences is slowly being altered as more and more women take up the opportunities offered by a career in academia. When it comes to the Dinosauria, we at Everything Dinosaur, have remarked on numerous occasions how the ankylosaurids and research into these heavily armoured Ornithischians seems to be overshadowed by studies focused on the Ceratopsian and the Hadrosaurs. So it is doubly pleasing to write about the naming of a new species of Ankylosaur, one that has been named by Victoria Arbour (University of Alberta). Victoria’s research into Late Cretaceous ankylosaurids has been featured in a number of our blog articles over the years, she has established herself as the “go to person”, when it comes to studies into this particular branch of the armoured dinosaur family tree. The new species has been named Zaraapelta nomadis. It is known from a nearly complete skull (missing the snout), from the Baruungoyot Formation of Mongolia. The fossil specimen was discovered in 2000 A.D. during an expedition to the Gobi Desert which was led by Professor Phil Currie (University of Alberta). The genus name is a combination of the Mongolian and the Greek for “hedgehog shield”, whilst the species name honours, the Mongolian company Nomadic Expeditions which has played a pivotal role in helping scientists to explore the Gobi Desert for dinosaur fossils. Thanks to the work of post-doctoral researchers like Victoria, scientists are beginning to work out that there were a number of different types of ankylosaurid present in the region that was to form the Nemegt and Baruungoyot rock formations. Similar research has revealed a number of different Ankylosaur genera present in North America (Dinosaur Park Formation). It seems likely that there was almost as much diversity in the ankylosaurids as there was in the Ceratopsians and Hadrosaurs. Zaraapelta was certainly a very prickly customer, the new species has been erected as the skull shows some unique morphology. For example, behind the eye sockets and over the rear of the skull there is extensive ornamentation, lots of bumps and lumps of bone, to us, this dinosaur reminds us of a giant thorny devil lizard (Moloch horridus). At the back of its skull there were distinctive horns with a prominent ridge along the top, the holotype specimen is being kept at the Mongolian Palaeontological Centre, located at Ulaanbaatar. The skull of Zaraapelta is even more spectacular than the other Mongolian armoured dinosaurs, the likes of Saichania (S. chulsanensis) and Tarchia (T. kielanae). In a paper published in the “Zoological Journal of the Linnean Society”, the research team, that included Professor Phil Currie and Demchig Badamgarav (Mongolian Academy of Sciences), provide a phylogenetic analysis of ankylosaurids from the Gobi desert. The scientists concluded that Z. nomadis was probably most closely related to Tarchia kielanae. Dinosaur with a very spiky head. Doctor Arbour explained that the elaborate and distinctive ornamentation on the skulls of these Ankylosaurs may have evolved as a way to show off in order to attract a mate. Head crests and extensive skull ornamentation in the Ceratopsian and Hadrosaurs are associated with display as well as for defence (in the case of the horned dinosaurs), but this idea is not generally applied to ankylosaurids. In addition to naming the new ankylosaur Zaraapelta, this study also re-examined previously named Ankylosaurs from Mongolia and found support for “resurrecting” a species that had been discarded by earlier workers. The science of naming organisms, called taxonomy, is more fluid than many people might realise, Arbour notes. Sometimes, researchers might determine that two species names represent only one actual species, in which case the name that was created first has priority (senior synonym). This was the case for an Ankylosaur called Tarchia kielanae, which was eventually thought to be the same kind of Ankylosaur as Tarchia gigantea. But new information from recent dinosaur discoveries, including this study, suggests that Tarchia kielanae might be a separate species after all, so the name has been brought back into scientific literature. Just as the phylogenetic analysis of ankylosaurids has changed, so it is all change for Dr. Arbour, next month she is taking up a new position as a post-doctoral researcher at the North Carolina Museum of Natural Sciences. We wish her well in her new role and we look forward to writing about her future research. Film buffs and dinosaur fans alike have been keen to hear news about the eagerly awaited release of the Jurassic World film trailer. The movie itself, is scheduled to premier on June 12th 2015 and a number of formats will be available including 3-D and IMAX but rumours circulating indicate that the trailer is being delayed for a few more weeks at least. Why all the interest in the trailer? The answer is simple, Universal Pictures and director Colin Trevorrow have been careful not to disclose any information about the actual prehistoric animals that will feature in the summer 2015 blockbuster, the fourth in the “Jurassic Park” cinema franchise. So far only stills showing some of the actors and a few carefully managed pics hinting at the prehistoric animals in the film have been released. The movie moguls are not daft, their intention is to squeeze every last penny out of the film and the merchandising spin-offs. They know that despite the strong cast list that includes Chris Pratt (Guardians of the Galaxy, Parks and Recreation), Bryce Dallas Howard (Spider Man 3, The Twilight Saga), child actor Ty Simpkins (Iron Man 3), it is the dinosaurs that people want to see. In terms of the Mesozoic cast list, the film makers have been keeping their cards very close to their chests. However, Everything Dinosaur reported back in June that one of the super-predators to be seen in the film will be “Diablo rex” a mutated dinosaur which had elements of Tyrannosaurs, Velociraptors and the ability to camouflage itself thanks to chromatophores from borrowing the genes extracted from Cephalopods. Addendum – The dinosaur is named Indominus rex in the movie. The official movie poster “Park Opens” shows a tyrannosaur skeleton in outline but film fans were hoping that the trailer would provide them with more information of the real film stars – the dinosaurs and other prehistoric animals. Earlier in the summer, Everything Dinosaur posted up pictures of one of the movie props showing the layout of the theme park that is a location for this new dinosaur film. The prop, which was a map of the attraction, contained an intriguing list of the prehistoric animals that could be viewed at the park. However, fans are eagerly awaiting the trailer to see if they can get a glimpse of the dinosaurs as they will appear on the silver screen. It had been planned to launch the trailer to Jurassic World in cinemas at the end of October, accompanying other trailers and advertisements prior to the showing of the Warner Bros movie “Intersteller”. The trailer, although completed, has been re-scheduled for a December release to accompany the third part in the Hobbit trilogy. The reason for the delay has been cited as purely a strategic reason. Jurassic World is currently in post- production and due for global release in June 2015, but the powers that be when it comes to films, know that the longer they can keep the dinosaurs a mystery, the greater the hype there is going to be. Children in Year 3 at Haverigg Primary School were happy to show our dinosaur expert how much they knew about prehistoric animals. Under the enthusiastic tutelage of the teaching team the children had been studying different parts of human history beginning with the Stone Age. We were happy to point out how long ago dinosaurs lived before the likes of the Stone Age came along, a simple demonstration using a clapping exercise was a helpful way of illustrating just how deep geological time can be. With the assistance of some very knowledgeable Year 3 students we explained how fossils form and what types of rock are likely to contain fossils. In addition, we helped the children gain an appreciation about what fossils can tell us (and perhaps, as importantly), can’t tell us about animals and plants that lived long ago. The children had created lots of very well labelled posters. Each class had been split into teams and given the task of researching and writing about a certain type of prehistoric mammal that might have roamed the land now known as the United Kingdom sometime in the past. All about Ice Age animals. In addition, we discussed the important role of Mary Anning and her contribution to the nascent science of palaeontology. We set each class a couple of challenges as part of planned extension activities agreed with the teaching team. The Everything Dinosaur team members are looking forward to seeing the results. Back in November 2013, team members at Everything Dinosaur wrote about of the most intriguing reports to come out of the annual Society of Vertebrate Palaeontology meeting that had just come to an end in Los Angeles. As the dust settled and the researchers made their way home, here was a chance to reflect on the remarkable work done to help finally resolve a fifty year mystery. What type of dinosaur was Deinocheirus? Huge fossilised forelimbs and shoulder bones, discovered by a joint Polish/Mongolian expedition to the Gobi desert in 1965 had fascinated scientists for nearly half a century. The arms were massive, measuring some 2.6 metres in length (including shoulder blades) and each hand ended in three-fingers, each finger tipped with an enormous, curved claw which in one case was over twenty centimetres long. Based on these huge arms and a few other scraps of fossil bone, most palaeontologists agreed that the fossils represented a giant form of ornithomimid, a member of the “Bird Mimic” group of Theropod dinosaurs. Although the arms were much bigger, they did resemble the arms and hands of agile, fast running ornithomimids such as Struthiomimus and Dromiceiomimus. A formal announcement was made about the discovery in 1966, and Deinocheirus “Terrible Hand” was described based on this holotype material in 1970. This was the cue for every dinosaur book publisher to include a picture of the fossil material in virtually every dinosaur book produced in the seventies and eighties, although very few attempts to illustrate the dinosaur were actually made if we recall correctly. The woman in the photograph is Professor Zofia Kielan-Jaworowska, the scientist who led the 1965 expedition. Although the limbs have been repositioned and remounted since this picture was taken, it does provide a very good impression of the scale of those fossilised limbs. Writing in the journal “Nature” the scientists behind the paper presented at the conference last year have revealed more about the “enigma” that is the Ornithomimosaur Deinocheirus mirificus. Turns out that this bizarre Theropod is even more amazing than previously imagined. In the journal, the scientists describe two new specimens of Deinocheirus that were discovered in the same formation (Nemegt Formation) as the original holotype material. These much more complete fossil remains have enabled the researchers which include Phil Currie (University of Alberta), Yuong-Nam Lee and Hang-Jae Lee (Geological Museum, Korea Institute of Geoscience and Mineral Resources) as well as Pascal Godefroit (Royal Belgian Institute of Natural Sciences), to build up a comprehensive picture of what this dinosaur looked like, where it lived and what it ate. A bizarre looking Theropod after all. It is certainly the largest member of the Ornithomimosauria known to science, with an estimated length of around 11 metres, several tonnes in weight and standing about as tall as a modern-day Giraffe, but it was no vicious super predator. Studies of the feet and hind legs indicate that this animal was probably a slow walker, one with a huge pot belly to boot. A pot belly? This dinosaur had an expanded pelvis with strong muscle attachments. It probably had a large gut to help it digest the tough plant material that it ate. The skull measures over a metre in length, but there were no teeth in the deep jaws. Indeed, over a 1,000 gastroliths have been found in association with the fossils, along with fish remains in the body cavity indicating that this animal was probably a mega-omnivore, eating plants, but also insects, small animals and fish. Deinocheirus lived next to a large river. Seventy million years ago, this part of Mongolia resembled the Upper Nile. The broad, wide toes with their blunt claws were ideally suited to assist this animal when walking over soft mud. It probably wandered into the river to feed on soft water plants, to catch the occasional fish and to avoid the attentions of the Tyrannosaur Tarbosaurus. However, evidence that Tarbosaurus fed on Deinocheirus has been preserved on some of the bones. Whether or not the bite marks and feeding gouges that have been identified indicate that Tarbosaurus predated on these large bipeds, or whether these marks were made as a result of scavenging a carcase remains unclear. However, the deep, “U-shaped” wishbone of this dinosaur and those big shoulder bones suggest that this ponderous giant could inflict some serious damage should any unwary tyrannosaurid venture too close to those huge arms. This dinosaur had a number of unique skeletal features, it had a pygostyle (fused vertebrae on the end of the tail), like a bird and a much thicker tail than its smaller ornithomimid relatives. Perhaps one of the most intriguing features are the large number of tall neural spines. The dorsal and sacral vertebrae have flat, blade-like extensions (neural spines). To us, these spatulate spines resemble the bones seen in the humps of Bison. Deinocheirus could have had a sail-like structure on its back, or maybe even a large hump. It has been suggested that the hump, originally reported upon in 2013, could have been exaggerated. These neural spines could have supported a network of ossified tendons to help support this dinosaur’s huge gut and heavy tail. A mega-omnivore that had to watch out for Tarbosaurus. The model making company Collecta introduced a 1:40 scale replica of the mysterious Deinocheirus back in 2012. At the time, we commended them for bringing out a model of this dinosaur when so very little of the total skeleton had been studied and described. With the information regarding the hump, we at Everything Dinosaur amended our scale drawing to give an impression of a small hump over the pelvis, but the latest illustrations really emphasis the hump or sail on this animal’s back. 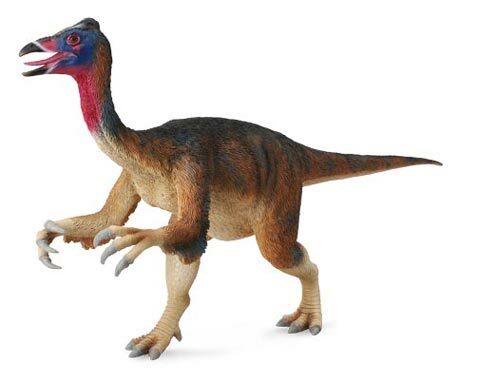 Ironically, Collecta gave their Deinocheirus model feathers, no evidence of feathers on the original holotype material or indeed on the more recently discovered fossils have been found, but it is thought that a number of ornithomimids were indeed, feathered. Scientists speculate that Deinocheirus was covered in simple feathers. As lead author of the scientific paper, Yuong-Nam Lee states the researchers were just as surprised as anyone when they put the complete dinosaur together based on the three main specimens that had been found to date. Summer may be over for us in the northern hemisphere and for the UK the clocks go back next week heralding some months when nights are going to be longer than days. 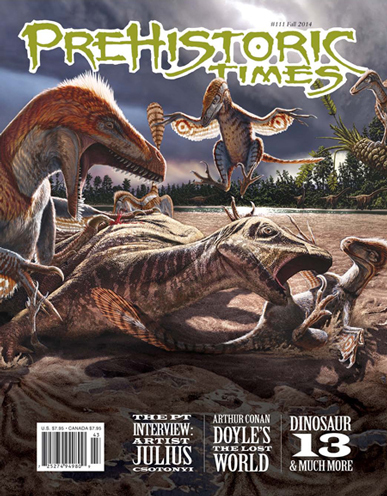 However, perfect fireside reading has arrived in the nick of time, in the shape of the latest edition of the quarterly magazine “Prehistoric Times” and once again it is jam packed with interesting articles, fantastic artwork and features. Decorating the front cover is a beautiful rendering of a Cretaceous fight scene between an unfortunate Hippodraco (iguanodontid) and a mob of Utahraptors. This artwork was created by the very talented Julius Csotonyi and inside this issue there is a super interview with the palaeo-artist and a review of his new book “The Palaeoart of Julius Csotonyi” by Julius and Steve White. Everything Dinosaur team members were sent a copy of this hardback a few months ago, it really is an excellent book showcasing the talents of a remarkable artist. The interview with Julius conducted by “Prehistoric Times’s” editor Mike Fredericks, is supported by lots of illustrations which show the range of prehistoric animals and time periods covered by Julius in his new publication. The scene featuring several Late Cretaceous herbivores demonstrating “dietary niche partitioning” is my personal favourite, although my nephew likes the eyeball-plucking raptor best – still that’s kids for you. One of the featured prehistoric animals is Baryonyx and there are oodles (scientific term), of great illustrations sent in by readers on this member of the Spinosauridae and we greatly appreciated the article by Phil Hore on this Theropod. We too, like Phil, have speculated on how many fossil specimens ascribed to prehistoric crocodiles in the past may well turn out to be evidence of widely dispersed spinosaurids. Special mention to our chum Fabio Pastori for a simply stunning Baryonyx drawing. The magazine has a bit of an “English theme” running through it. Dinosaur discoveries of southern England are documented in another article, which features the artwork of John Sibbick and there is a well written piece by John Lavas that discusses the impact of Sir Arthur Conan Doyle’s “Lost World”, a novel that we are informed has not been out of print since its publication back in 1912. Bringing things right up to date, our review of “Dinosaurs of the British Isles” is featured, a book which documents and catalogues the Dinosauria known from these shores. Tracy Ford continues his series on how to draw dinosaurs by discussing integumental coverings – feathers, quills and bristles on the Dinosauria. He makes some excellent points and it is great to see a piece that features one of our favourite dinosaur discoveries of recent times, Kulindadromeus zabaikalicus. This little feathered, plant-eating dinosaur makes another appearance in the Palaeo News section, along with updates on the Spinosaurus quadruped/bidped debate, giant prehistoric birds, a newly described Archaeopteryx specimen and a short report on Dreadnoughtus schrani . Dreadnoughtus is important as a large number of bones have been found, helping palaeontologists such as Dr. Kenneth Lacovara (Drexel University), to estimate the body mass of this huge Titanosaur. This dinosaur discovery adds a whole new dimension to body mass estimations using femora radii. Everything Dinosaur wrote a short article on this discovery, it was favourably commented upon by the scientists behind the research paper and we basked in the glory of being praised by the researchers (for a few days at least). Dan LoRusso is interviewed about his work on the Battat “Terra” model range and there is a special feature on the bizarre, sabre-toothed Thylacosmilus. The “English” theme is re-visited once again with a fascinating article penned by Allen A. Debus which examines the way palaeontology was depicted in the popular press of the 19th Century, the list of references at the end of this article is especially helpful. Amongst the many other features and news stories is an interview with Todd Miller, the director of the film all about the controversy surrounding the Tyrannosaurus rex named “Sue”, the thirteenth documented T. rex dinosaur discovery hence the film’s title “Dinosaur 13”. We had the very great pleasure of meeting Pete Larson in London just a few weeks before the film’s August 15th premier. Pete chatted about the documentary and Everything Dinosaur did some work on behalf of the media company responsible for the distribution of this excellent film in the UK back in the summer. Ah well, summer may be over but at least we have another super edition of “Prehistoric Times” to keep us occupied over those long autumn evenings.